We have written one of the bestselling books available on how to find investors, positioning your pitch, and raising capital. The problem with the way most professionals try to raise capital is that they cold call investors, are not targeted in the type of investors they go after, don’t add value first, have not researched their competition, and typically they don’t allocate enough resources to effectively communicating with investors. 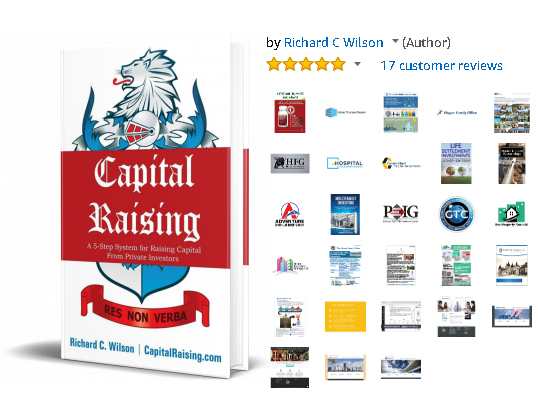 It is more important to add genuine value, and offer something so unique, that it hits your target investor between the eyes than it is to have an expensive logo made up.We share dozens of stories within this book, case studies, free videos, a worksheet to complete, and more for free because we have seen that the more we give away on investor relations and capital raising the more long-term relationships we keep building in this space.To download this free book in PDF format now and get access to examples of our pitch decks, and marketing assets created which are part of our pitch packages please complete the form below.